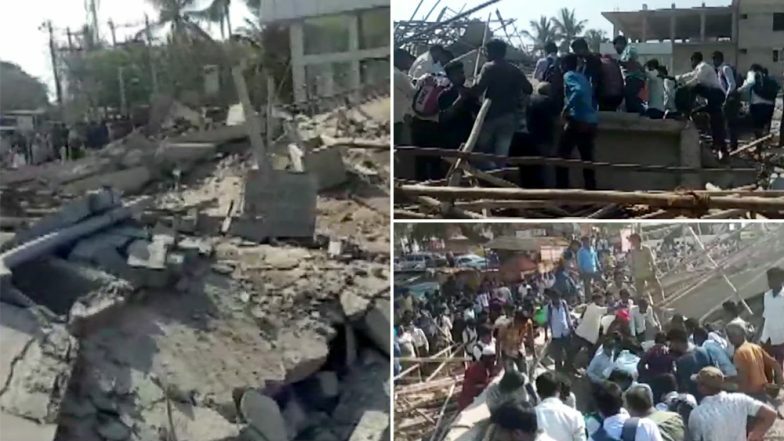 Bengaluru, March 19: At least two people died and six people sustained injuries after an under construction building collapsed in Kumareshwar Nagar, Dharwad district of Karnataka. Over 40 people are feared trapped under the rubble, said reports. It was a five-storey building under construction. The incident reportedly took place on Tuesday afternoon of March 19, 2019. An operation is underway to rescue those trapped under the rubble. Authorities are at the site of the incident. The reason behind the collapse was not immediately known. As per preliminary information, Basavraj Nigadi, Gangadhar Shintre, Ravi Sobrad are the owners of the building that collapsed in Dharwad. One of the owners Gangadhar Shintre is father-in-law of Congress leader Vinay Kulkarni. Karnataka Chief Minister H.D. Kumaraswamy expressed "shock" over the building collapse. "Shocked to learn about the collapse of an under-construction building in Dharwad. I have instructed the Chief Secretary to supervise rescue operations. I have also directed the CS to send additional resources and expert rescuers by a special flight to Dharwad," he tweeted.